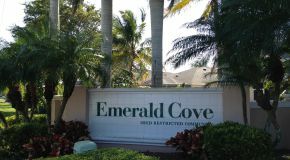 Emerald Cove is a private gated community that sits on the east and south borders of Weatherly Lake. Most of the homes were constructed from 1996 to 2001. There are 101 homes with a mixture of one and two story styles. Some homes have their own pools. The community is very quiet with tree lined streets and Weatherly Lake is a big attraction. The clubhouse and pool overlooks the lake and is near the gate entrance, there is also a long fishing pier at the same location. A sandy beach, children's play area sits right on the shore line of the lake. The HOA fees are very reasonable at about $160 a month as of March 2019. Located just east of two schools: The Challenger Middle School & The Patriot Elementary School is great for family's with young children. Being right off of Trafalgar Pkwy provides quick access to major roads to access all points with a central Cape Coral location. If you're lucky enough to purchase a home on the lake you'll enjoy the gorgeous sunsets over Weatherly Lake and admiring the water view, wildlife and other scenery. There is a public boat ramp nearby for boaters to access the lake for fishing, cruising or water skiing while enjoying Florida's tropical relaxed lifestyle. The lake connects through a long canal system to 7 lakes, the best canal circuit in Cape Coral. 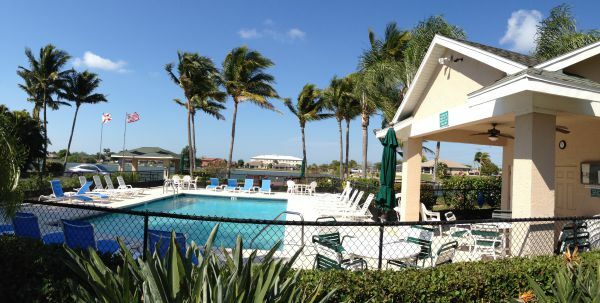 Come see Emerald Cove and what it has to offer, it's one of Cape Coral's loveliest gated communities for elegant SW Florida tropical living!